This issue happened to my car and instead of taking it to the dealer to get it fixed, I thought I would attempt to fix it on my own with help from a friend. You will need to take the door paneling apart in order to access the rail/track. I have outlined the instructions below with pictures. I hope this helps. · Keep screws and pieces in some kind of order on the floor because when you need to put everything back, you will need to follow the instructions in reverse exactly how you took it apart. · All of the work will be done while the door is open either partially or all the way. · If your battery dies easily, you may want to disconnect the power to the car before starting if you think it’s going to take you a long time to do this. I did not and had no issues, but others have. · Be careful with the pressure put on the door when it’s open…pushing or pulling a little too hard could bend it’s arm which will prevent it from closing properly. · Be careful of the body of the car. There are times when you will have to put weigh on it. The car is very delicate and dents easily so the last thing you want is to have some dings show up while you’re doing this. I suggest covering it with thick blankets and being extra careful with your tools while working on it. · Make sure you and your friend both stretch your bodies before attempting this. Some of it requires you to be in awkward positions for long periods of time and pulling a muscle is no fun. · The 2nd person is needed to hand the other person the tools they will need and to hold the door open in various angles as required. · When taking things apart, take pictures of how they were arranged or pay very close attention to it so you can put them back exactly the same way. This goes primarily for wire and screw placements/connections. 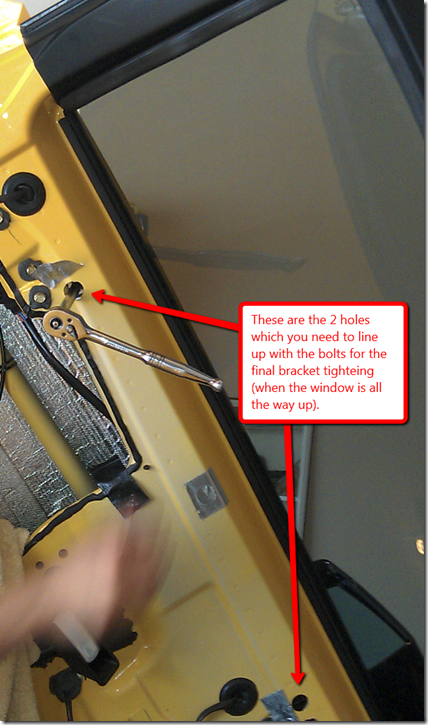 · The biggest concern is amount of force you will use to loosen and tighten the bolts on the window tracks. The tracks are mounted to a vertical beam with a plastic clip. You do not want to break that clips! While you are loosening or tightening the bolts, you will see that you are also putting a lot of pressure on the clips. 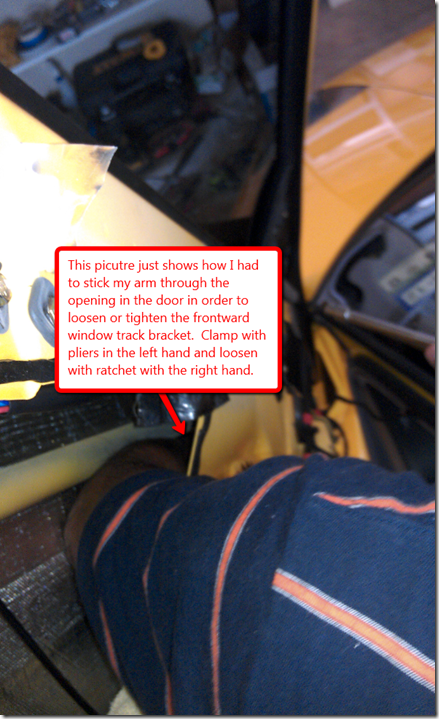 Hold the track with a pair of pliers in one hand and your ratchet in the other. These bolts are also VERY tight and you are working in very difficult angles which make it even more difficult because you have nothing to leverage against. Under the engine bay hatch, there is a small black knob that allows you to disconnect power from the battery. If you choose to do this, be sure to set it back when it comes time to test. I feel this is overkill and is not really a necessary step unless you know you have a very weak battery. To avoid this, just make sure the key is not in the ignition while you are working, no dome lights are on, etc. A. 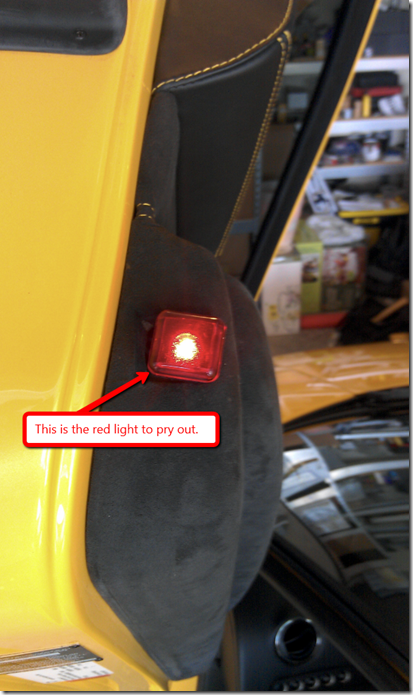 With the door open all the way, you will see a square-shaped red lens which is used as a light. Using a small flathead screw driver, pop out the lens. Pull out the wire for the bulb and disconnect the bulb (careful, the bulb will be hot if it was on). 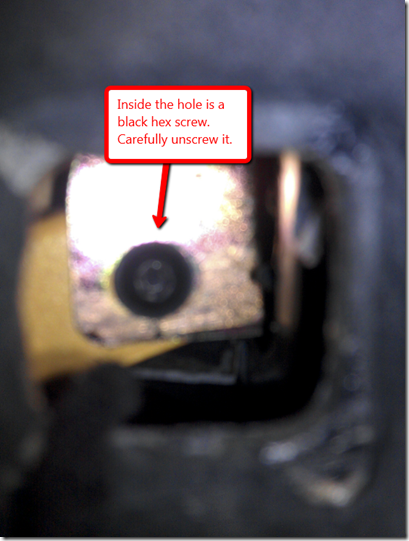 You will see a hex screw inside the hole. 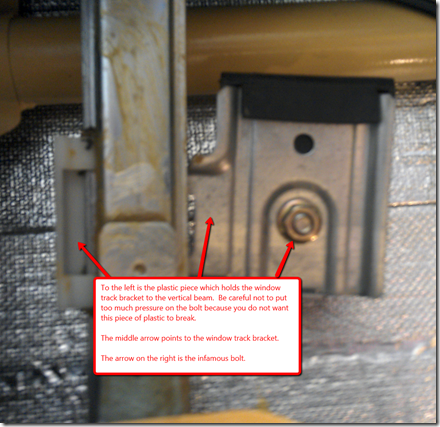 Loosen it and be very careful about pulling out the loose screw to avoid letting it fall into the door panel. If it does fall in, no problem, you will be able to get it later, but when you’re putting things back together, that’s not an option (or you will have to take the door apart again). B. Next, sit in the seat facing the door panel. Have your helper hold down the door enough for you to be able to access the door speaker (you probably need to stay in this position for a while for this step and others coming up). Use your small flathead to remove the door speaker cover very gently. Remove the rubber trim and then you’ll see 4 screws holding the speaker to the door panel. Remove those screws, pull out the speaker and disconnect the speaker wires. 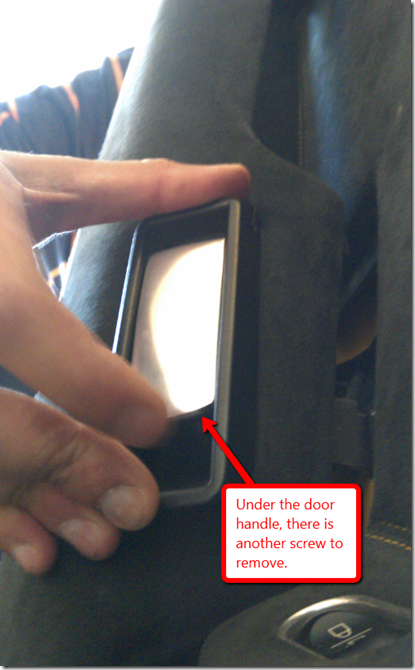 C. Now, lift up the inner door handle and you will find another screw under it. 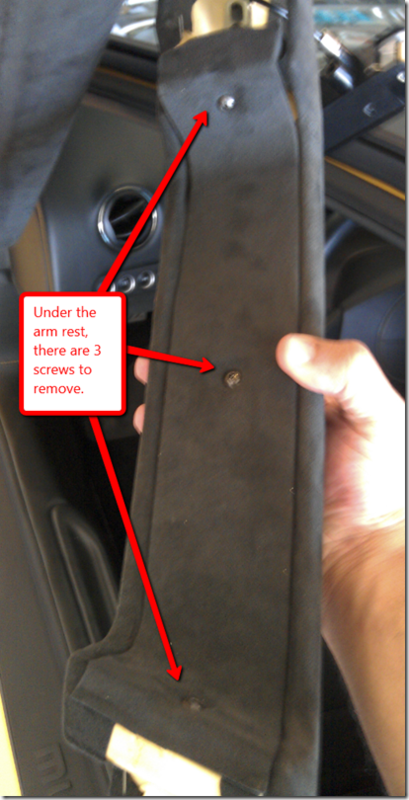 Take out the screw and you will notice that the armrest is now ready to come off, except the inner door handle is still attached (not allowing you to take it off completely). D. Flip over the arm rest and you will find 3 more hex screws. Remove these and take off that cover. E. Inside the arm rest, there are 2 brackets. One has 2 screws and the other has 1. You may mark the placement of the brackets with a marker before removing them so you can put them back in exactly the same place. 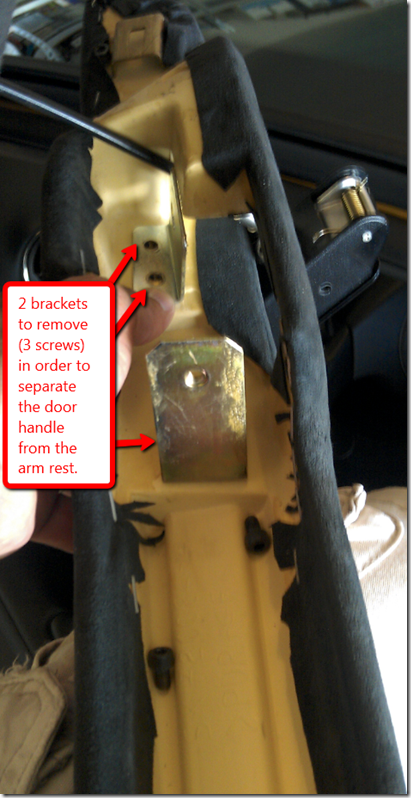 F. Once these brackets are off, you will then be able to slide out the inner door handle which will then allow the arm rest to detach from the door panel completely. G. Towards the front right side of the door panel (behind the side view mirror), there is a triangle-shaped cover. This simply pops off by hand if you tug on the edge of it. Do this. H. Under that, there is another cover piece, it too simply snaps off so remove it too. I. You will see a piece of duct tape under the first cover. Remove the tape to expose a 10mm bolt. Unscrew this bolt and disconnect the wire connects you see there. J. The door panel is now ready to come off. Wiggle it out carefully. Disconnect the tweeter wire and you should be good to go. A. Now you are ready to get to the core of the issue. The inside of the door has several cut outs. 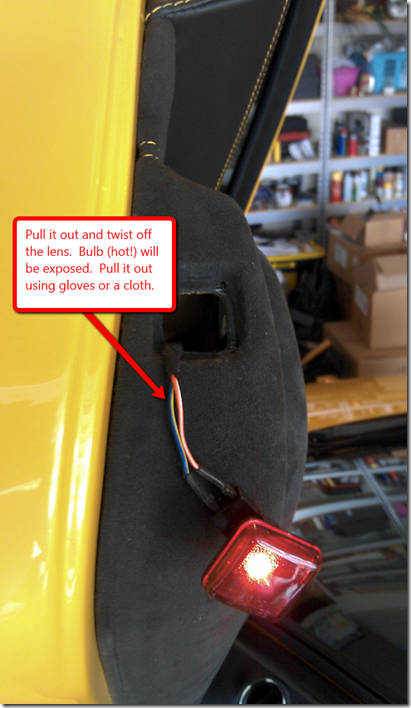 Turn the ignition to power the interior and push the down arrow on the window switch while watching the door. You will see that there are two, 2-3” wide, brackets which move down while your window does not. Either one or both are no longer attached to your window and hopefully they are not broken. This is why the window is not moving up or down or is moving in strange angles. If something is broken and simply did not come off the track, you will probably need to get some parts. B. You need to place the brackets in a vertical position which allows you to access them with a ratchet and socket (using the up/down power window switch). I suggest using an extension on the socket to give you more leverage. You need to be very careful here. The brackets are attached to their respective vertical beams by plastic clips. You do not want to break these clips by putting too much force while loosening or tightening the bolts. Assuming you are doing the driver’s side window, hold the clips and brackets in place with some pliers in your left hand and the ratchet in your right. Start with the clip towards the rear of the car first. Loosen the bolt (on my car, this was much easier said than done. The bolts were on extremely tight and due to the position you are in, it’s quite difficult to do it). The second bracket is towards the front of the car. This one is even harder to access, especially if you want to use the pliers to protect the plastic clip. You will need to stick your left arm through the large opening towards the back and hold the bracket with pliers. Then your right hand can do the loosening. C. Once the bolts are off, you will be able to take out the rear part of the bracket along with the black rubber which the window sits on. Examine the rubber to see if there is any grease or other deposits on it. If so, clean with any degreasing agent and let dry for a couple of minutes. D. Place the rubber back and put the bolt on by just a couple of threads. Now slide the window into place but having your helper push the window down manually. Make sure it goes into place on both brackets and goes in as much as possible. 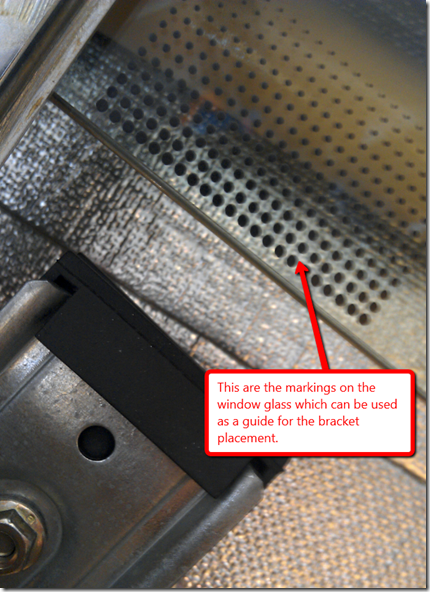 The window has some dotted lines on it to indicate where the bracket should go so use this as a guide. E. Tighten the bolts as much as you can, but not all the way, again, being mindful of the plastic pieces holding the brackets to the vertical beam. Also, the brackets do have some play in them so don’t think you did anything wrong if they move up and down a bit. They are designed to do this. F. Now, using the power window switch put the window up all the way. Towards the top of the door, you will see 2 pieces of duct tape covering 2 circular holes. Remove the tape from both. With the window up all the way, if you did everything correctly, you should see the bolt lined up with this hole. Insert the same socket/ratchet into the hole and tighten the bolts all the way. Test the window operation by using the power switch. Go all the way down and all the way up. If you see any issues, repeat from the steps above as you see necessary. Otherwise, put the window back up and continue. Put everything back in the exact same order that you took it off. Be sure to also put it back exactly how it was when you disconnected wires or removed bolts/screws. Once you have put everything back together, test the opening and closing of the door to make sure it didn’t go off alignment while you were working. Now test the window again by moving it down and up. You’re done!